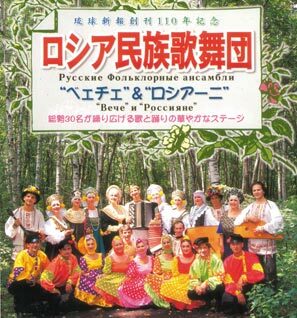 Russian folk ensemble Be’echie & Russiani performs at Okinawa Convention Center on Oct. 1 starting at 7 p.m. The troupe dances and sings to the tunes of accordion and balalaika with its repertoire including such renowned tunes as Bubishki, Volga, Troika and Kalinka. The Vladivostok based group has been performing since 1990 to packed audiences in every part of Russia. Tickets are ¥3,500 in advance and ¥4,000 at door and are available at Ryukyu Shimpo offices, department stores, Fukuhara Music Store and Lawson and Family Mart convenience stores.